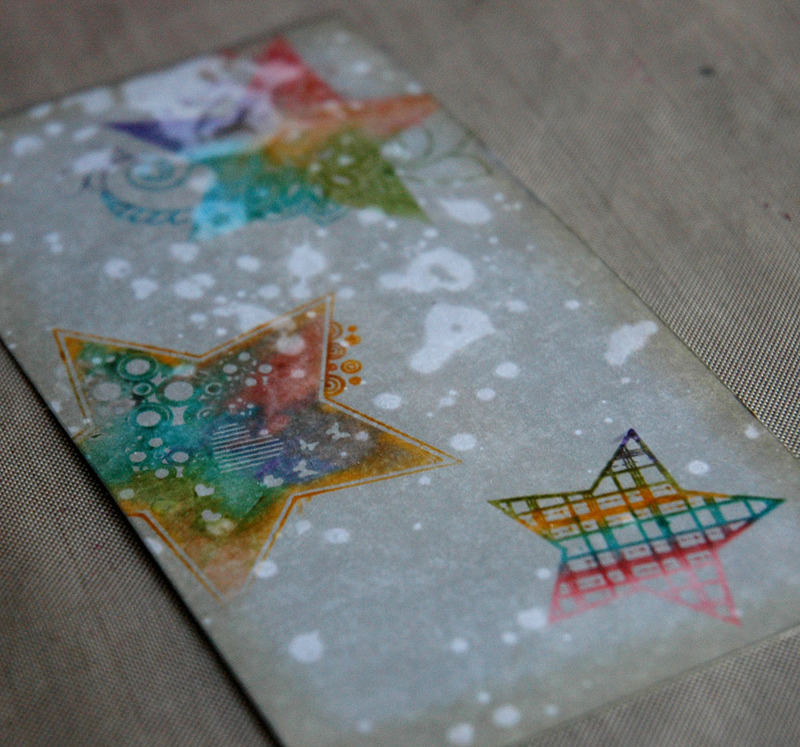 This one is actually super simple – I wanted to play with my new stamps and the Distress Marker over gesso technique I used on the house card. 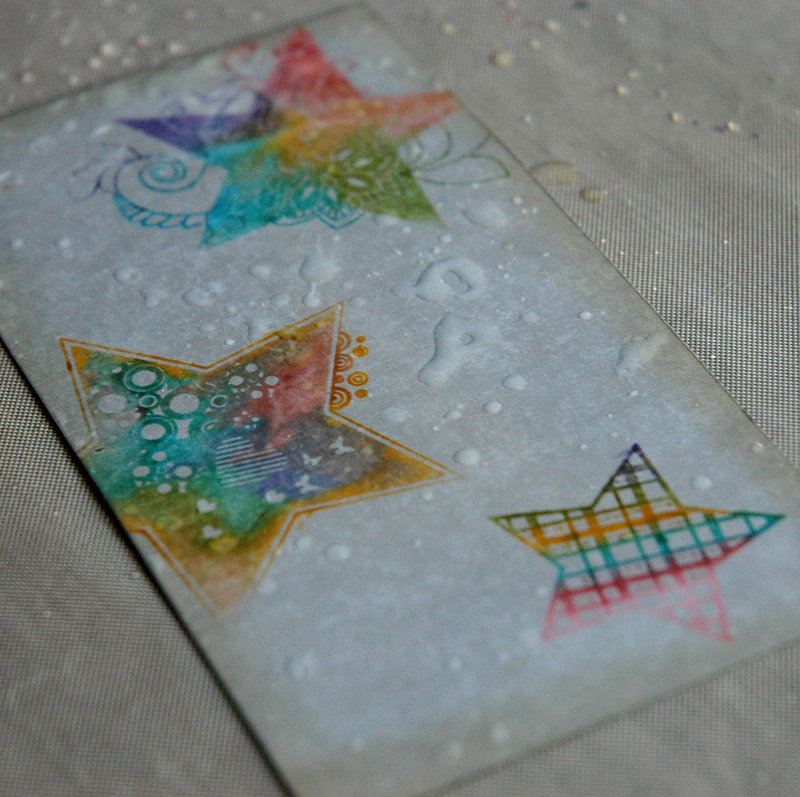 I slopped on some gesso and heat it so the gesso bubbled and popped – lots of fun texture! 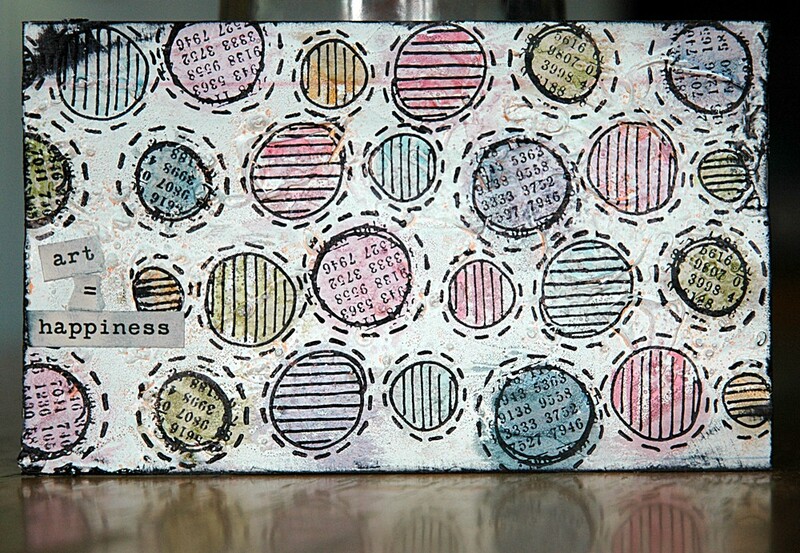 I then stamped the circles from Around the Edge with Jet Black Archival Ink and coloured them with different Distress Markers. I used my finger to smear and lighten the markers, making some darker areas where I first laid down the ink. I then distressed some word stickers and added them to finish it off. 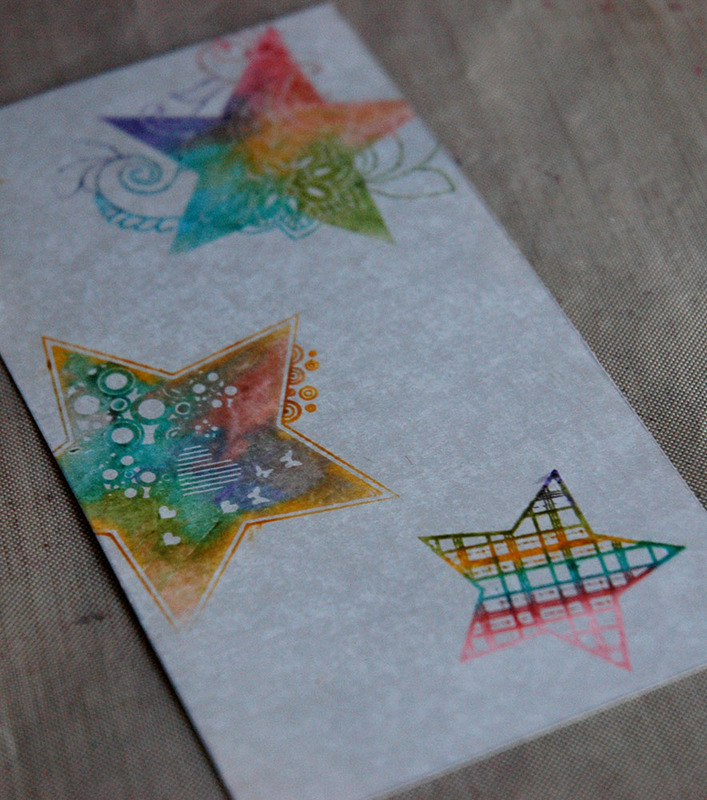 I just have to say, the more I use Stamper’s Anonymous Stamps, the more I love them – the quality is amazing! Just some odds and ends, random stuff for today! Saturday there was a day long crop held at The Paperie and we had a blast! 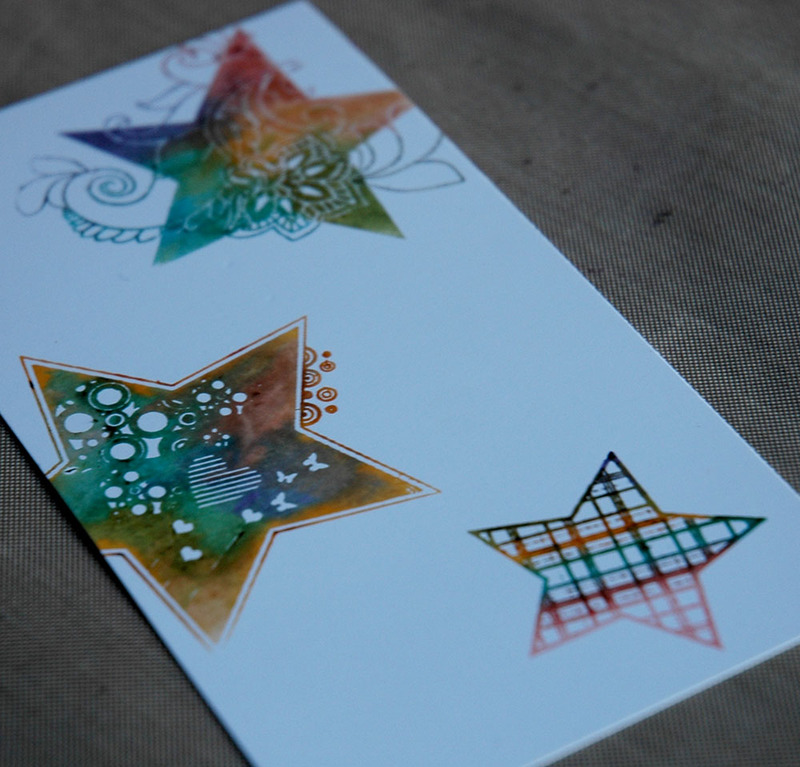 I made a couple of cards, played with Distress Markers (and made 2 people buy the whole canister of 37! 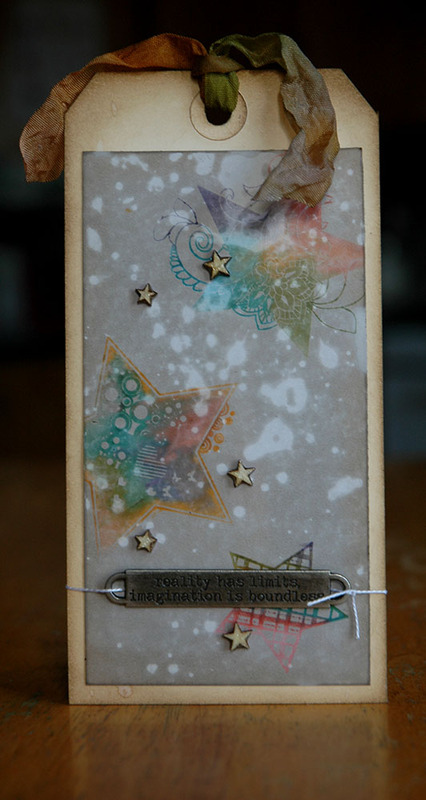 ), and made my LO for the Designer Duo class Cathie and I are co-teaching this coming Sunday. This is going to be a super fun class because we both have the same products and totally different styles. 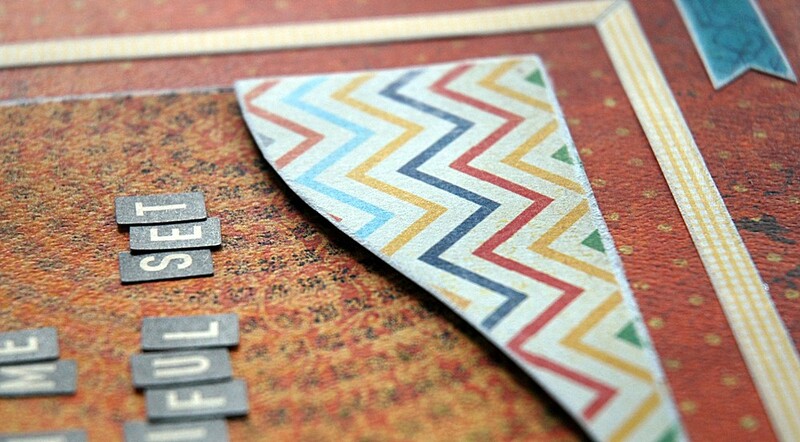 At the class everyone gets some great product (patterned papers, wood paper, letter stickers, a stencil from The Crafter’s Workshop), two completed LO’s and two different teachers – all for $35 if you’re a member! That’s a steal, my friend, trust me! 🙂 And Cathie is amazingly talented, you’ll all love her LO and great techniques! Also on Saturday I got a text from D saying he was facing the Spanish Inquisition – I’ll do another post on that later today so watch out for it! M is pretty funny, just sayin’! It was a last minute addition (truly, I thought about it at 11:30 the night before and did the LO during our lunch break!). I thought it would be good to do a few of these throughout the year in case anyone wanted to highlight a particular story or event. They could also be mounted on a 12×12 background and used for other albums! I’m posting it here for those people who missed yesterday’s class – for that crowd, be on the lookout for the .pdf with picture and instructions later this week in your email. 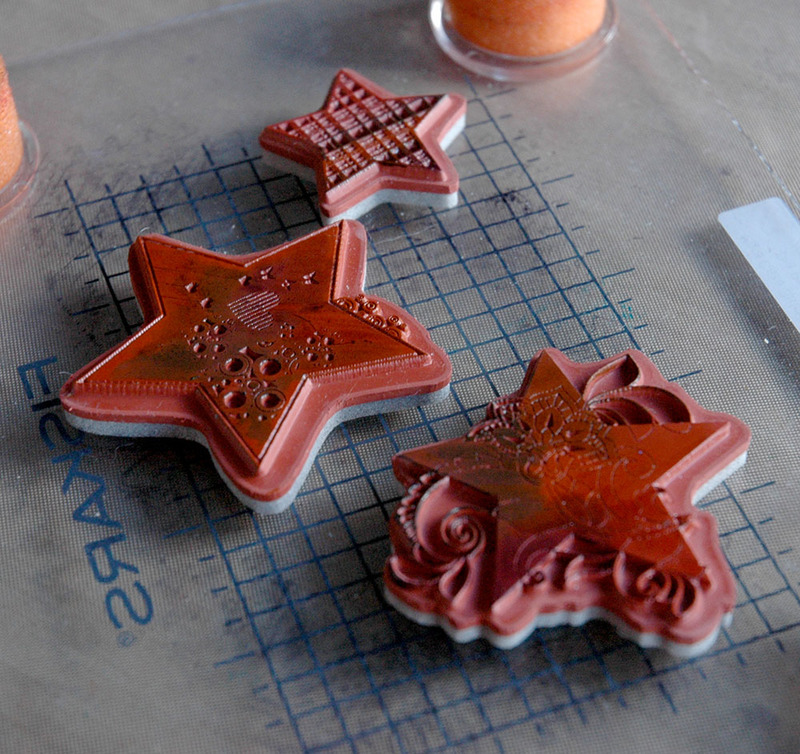 I’ll be back tomorrow with some more fun dry embossing techniques so be sure to come back and check that out! Things on Thursday – CHA Edition! The Craft and Hobby Association (CHA) just finished up their big show in Florida where manufacturers released their new product for the year. I thought I would give you a run down of my needs! As an aside, I had an entertaining email chat with a friend (Hi Cathie!) about the difference between wants and needs and she agrees with my reasonings for the needs list. Now I’m fully justified in buying! 1. 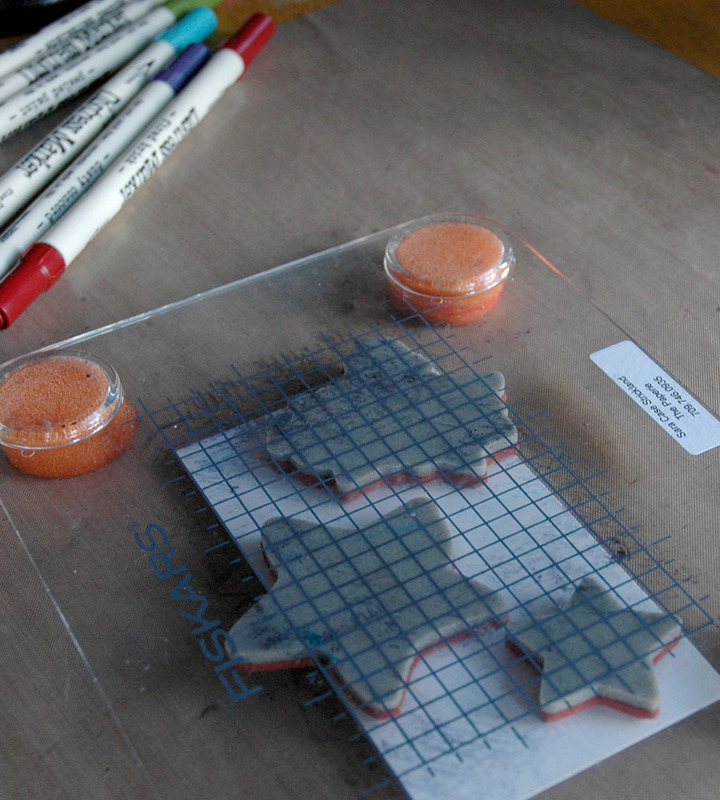 Distress Markers. 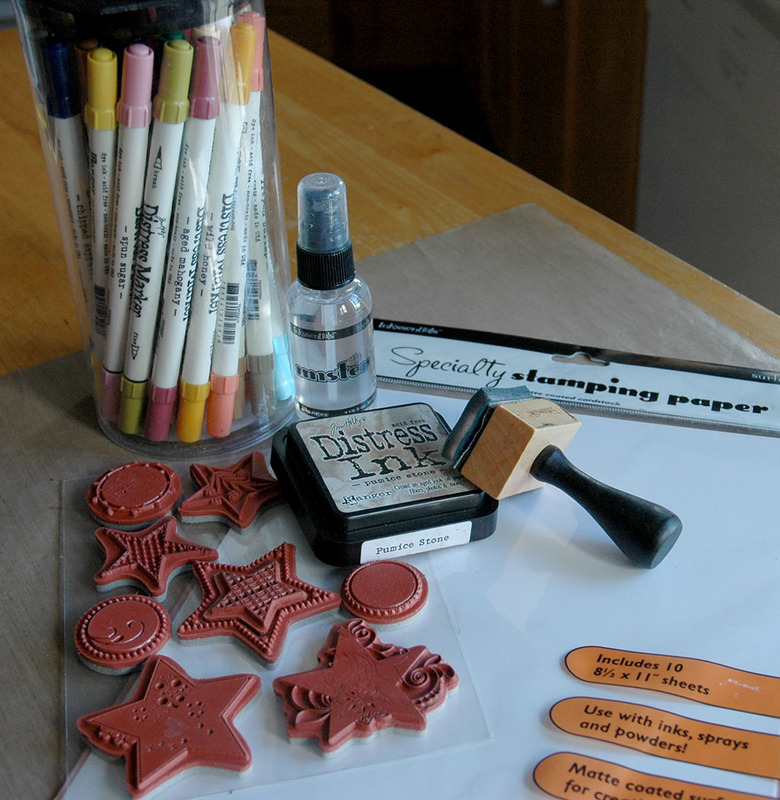 Yes, I own a zillion Stampin’ Up markers, but these are different, really and truly. They match all my Distress Ink pads! And there’s a white one too! 2. Studio Calico wood veneer shapes. I love these, they take mist and ink beautifully and look great just left plain. They’re the perfect embellishment. And they’re releasing people and cameras – perfect for my Yearlong Album! 3. October Afternoon SprINKlers. I admit to a slight problem – when I love something, I must have it in every colour (case in point, Distress Ink). And I really love the chalk finish and quick drying time of SprINKlers. Plus the new colours are amazing! 4. Heidi Swapp Memory File. I was shocked by this one, shocked. Love the system and think it’s brilliant, though I know I’ll never do it (but it really is genius). What I really want are the FotoStacks – again, perfect for the Yearlong Album. 5. Simple Stories/Unity Stamp Company. I love Simple Stories – we’re using the Year.o.graphy line for the 2012 Yearlong album – and Unity makes really great rubber stamps, so to get both in one product? Awesome! Especially when they make these, maybe my favourite release of CHA. 6. 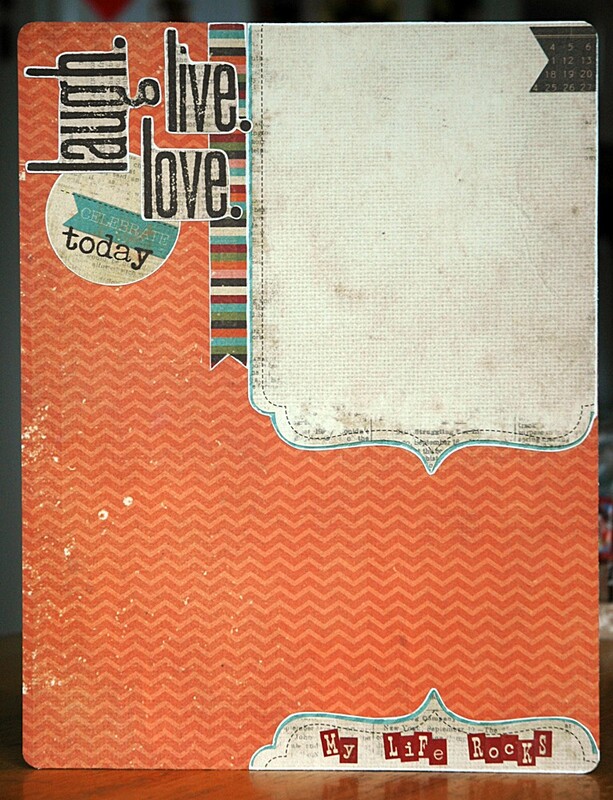 BoBunny Vintage Double Dot Cardstock. 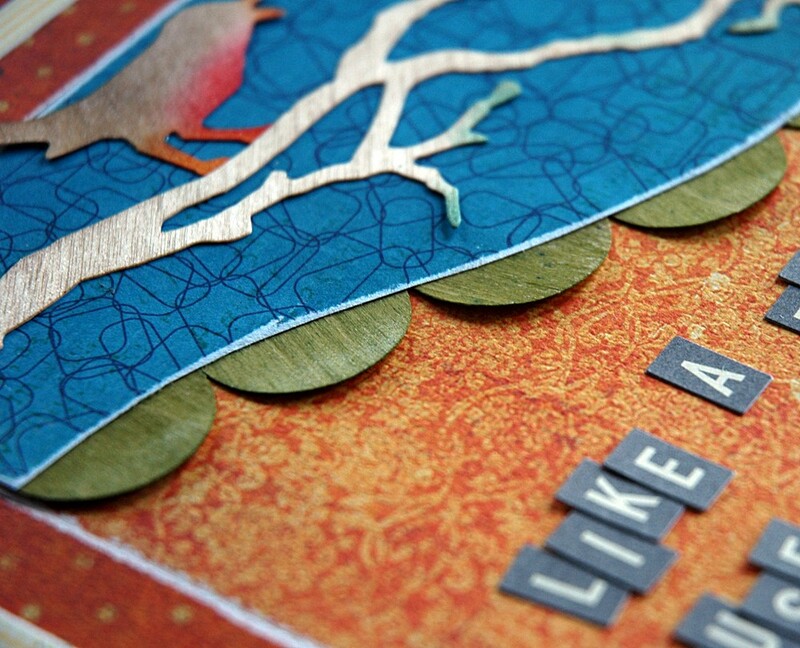 The DoubleDot has been my favourite go to cardstock – great weight, great colours, great tone on tone patterns. And now, just when I thought it couldn’t get better, it’s vintage! 7. Now, that’s not my full list, there’s still Tim Holtz/Idea-ology Chitchat Word Stickers, and washi tape galore, Basically Bare albums, Simple Stories everything (especially the pockets), stamps….. it’s all bad people, it’s all bad!